Ace Duck is a fictional character from the original Teenage Mutant Ninja Turtles franchise, and started out first as an action figure from the TMNT toy line. Krang having a craving for duck brain arranged for one to be transported to Dimension X, but a test pilot named Ace Conrad was caught in the transport beam and cross-mutated with the duck. After crashing his plane and landing in the sewers, he came across the Turtles and eventually found himself in their employment as the pilot of their Turtle Blimp. Even though he’s employed by the Turtles, Ace is still their fearless, flying friend. As with several action figures from the TMNT toy line, Ace Duck eventually made it into the cartoon series. Unlike the other characters in supporting roles, however, Ace Duck’s appearance in the series was incredibly brief. In the third-season episode “Attack of Big MACC,” Michaelangelo was watching an Ace Duck film festival on television. 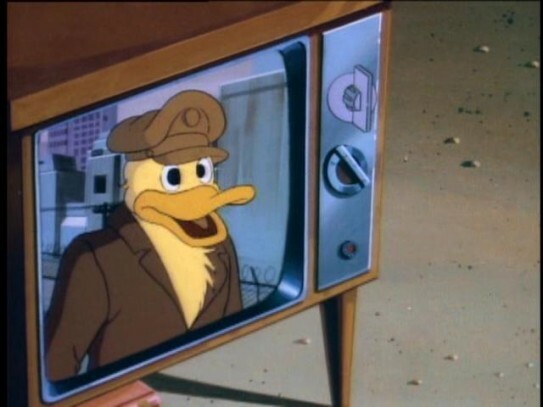 Ace can be seen on the Turtles’ TV screen in close-up, cackling in a manner highly reminiscent of Donald Duck, but his cameo is brief, lasting only seconds. Ace Duck had an actual (though minor) role in the TMNT Adventures comic series where instead of being a mutant, he’s an alien from the planet Perdufus. In this version, he’s a wrestler for Slump’s Intergalactic Wrestling circuit, of which he is reigning champion. Though he never actually fought or interacted much with the turtles themselves, he was always seen fighting in a match before the turtles would face their own match. The first time we see Ace Duck fighting it out with Leatherhead, and the second time he battled a werewolf-type monster named Bloodbath. In both fights, Ace Duck started out mocking his opponent, but his constant babbling about how perfect and amazing he is always becomes his own undoing. As a wrestler, Ace Duck is much more ripped than his action figure counterpart, and nothing about being a pilot is ever mentioned. Nor do we see what he usually wears when not in his wrestling attire (red trunks basically). His biggest flaw is his own arrogance and admiration of his own physique. His talking about himself often distracts him from his opponents which makes him lose the match. It’s unknown how he’s still champion when he keeps losing matches this way. The Ace Duck action figure was released in 1989.